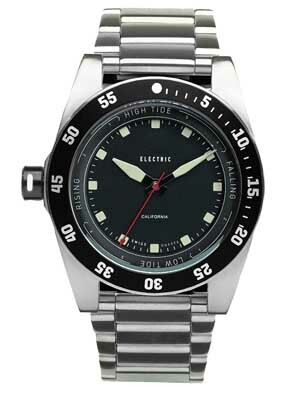 If you encounter the term electric watches, you might think it refers to a watch with a battery. That would be true, and in most cases, that’s exactly what the term was intended to mean by its user. 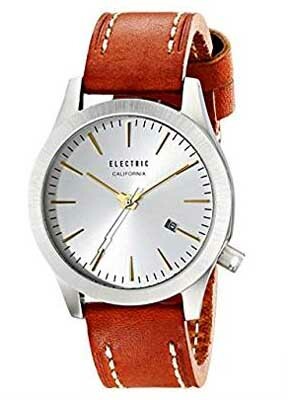 But the term also refers to a specific brand of watch, as Electric, or Electric California, as their Website calls it, is an eyewear and accessories company that also happens to make some pretty good watches. The company offers a few dozen different models, in both men’s and unisex models and yes, they are electrical watches, with quartz movements. They’re also very well made timepieces, with rugged build quality, diverse styling, and surprisingly affordable prices. 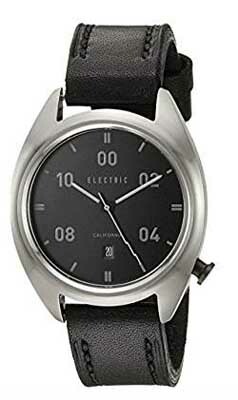 The company says that their products are designed in California and made in Italy, though we’re not sure if that applies to their watches or not. If you’re looking for something different that will likely offer you years of service, good styling and which won’t leave you broke, this brand is worth your consideration. 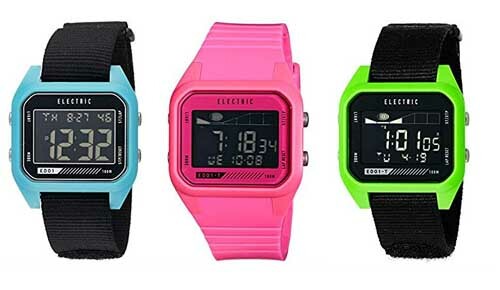 Read on for the full Electric watches review. For timepieces that target a relatively inexpensive price point, you’ll find surprisingly good build quality. The cases are made from durable stainless steel, and bracelets are available in stainless steel, while straps are either leather or nylon. The watches have mineral crystal, rather than the more expensive sapphire crystal, to protect the watch face, but most models have much better than average water resistance, with most models rated to at least 100 meters and some rated at up to 300 meters, which makes them suitable for diving, rather than just being OK to wear in the rain. The name isn’t just a clever one; the watches are electric. As far as we know, all models feature quartz electronic movements sourced from Japan. These movements are powered by batteries, and Japanese quartz movements have a reputation for being both reliable and accurate. Quartz movements also have the advantage of requiring little in the way of maintenance. There’s not a lot of technical innovation here, as they’re intended as a fashion accessory, rather than a standalone watch brand. Still, we noticed a few models with the crown on the left side of the face (at the 9 o’clock position) which makes them suitable for left-handed people. We also saw one model that had an indicator for tides, which is not a feature we see on a lot of diving watches. Styling is all over the map, and does seem to be a bit unfocused. All of the watches we’ve seen had round faces in the 44-45mm range, though many models are labeled “unisex”, rather than as men’s models. Most of the models in the product line have analog displays, and those models largely feature black or white faces. A few models, however, feature digital displays, and those models offer brightly colored cases that will really stand out when you wear them. The only complications we’ve seen in Electric watches are chronograph and date, though at least one of the diving watches does allow you to track the tides. The remainder of the timepieces in the product line are time-only, but that’s fine; they’re fashion accessories, and not intended as go-to tools. Maintenance is simple and straightforward, as all of them feature battery-powered quartz movements. This means that you will have to have the battery replaced every two to three years, but aside from that, no further maintenance is necessary. You should store your watch in a cool, dry place, and keep them away from extremes of temperature and strong magnetic fields, as either can damage the fragile watch movement. With proper care, you’ll find that your watchswill run well for years to come. According to the Electric watches Website, the warranty they offer with purchase is for one year against defects in materials and craftsmanship. This is a bit below average; most watch brands give a two year warranty. On the other hand, most defects are rare and they’ll likely show up quickly and well within the warranty timeframe. It’s worth noting that some retailers will offer an extended warranty at purchase, so you may wish to inquire about that. 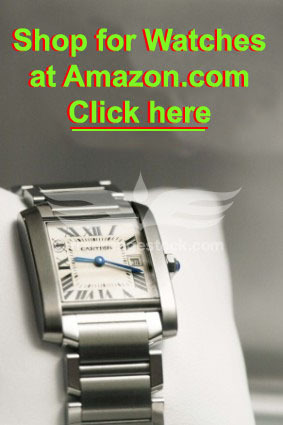 When it comes to designer watches, you’ll find that these watches are quite affordably priced. They’re often on sale, and we’ve seen some models offered for less than $40 at various times. The highest prices we’ve seen were in the $950 range, but probably 75% of the product line falls in the $75-$200 range. That makes this brand affordable for just about everyone, and it makes them a particularly good value given that they have exceptionally good water resistance that one usually only sees in much more expensive timepieces. Prices will vary widely from one retailer to another, however. We’re not aware of any brick and mortar companies that carries this brand, though we have seen them at a number of online retailers. You can purchase them at the official Website, but you might not actually want to do that, as they don’t have very many models in stock there. We’ve seen more models for sale at other retailers, including Amazon, which also offers some pretty competitive pricing. We’d recommend that you look there, as they’ve got more models from which to choose. Fashion watches, especially those that are sold as accessories, rather than as the company’s main product, are all over the map when it comes to style and build quality. Unlike many “me too” products, Electric watches are well made and quite durable, with rugged stainless steel cases, better than average water resistance, and accurate and reliable Japanese-made quartz movements. The styling is fairly diverse, with bright colors and a lot of chronograph models, along with many traditional time-only models that will be suitable for a day at work. If you’re looking for something different that offers good value, Electric watches are a good choice.